The rules of good behavior of a devotee’s life are called Vaisnava Sadacara. Everyone should learn these rules because, out of ignorance, one can commit aparadhas, offenses, which damage devotion. Many of these are rules can be found in civil life, doesn’t belong necessarily only to us, while others belong specifically to the sphere of bhakti. Days ago we discussed on the topic concerning interrupting a devotee who is giving a lesson or making comments at the end. I’ll say something about this. Unless one is saying meaningless things (Krishna is not the Supreme Personality of God, it is okay to eat meat, a cigarette has never hurt anyone and nonsense like that) you must respect the person who is giving class, whoever he is. At that moment he is sitting on the asana, representing the parampara and one must either just listen or ask questions. Never interrupt while he is talking. When the time for questions comes, you should ask questions and not make commentaries. If the devotee is younger and he specifically asks senior devotees to make some comments, it’s okay to do them but not like “contrary to what you have said so far …” This would be a lack of respect due to every Vaisnava, younger or older than us, and his commentary should keep the same harmony. Devotees of the same time or younger should refrain from commenting. If one has listened to the youngest devotee say inexact, wrong or simply philosophical imperfections of secondary importance, these can be corrected in later classes or at other times. None of us is Vyasadeva, mistakes can happen. 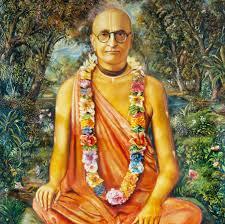 I remember that during the last parikrama in Vraja I said that Srila Bhaktisiddhanta Sarasvati withdrew to Radha Kunda to do austerity before beginning his preaching activity. It was a mistake, this happened in Mayapura and not in Radha Kunda, and one of my godbrothers corrected me. In general, the correction should take place in private and not in public, but devotees know that our history and philosophy are so vast that it is not possible, in a fraction of a second, to always remember and recall everything. Now, let’s suppose that he who are giving the class is a much older devotee and he eventually asks for “questions or comments”? Generally he is showing humility, and he is not really asking for comments. The advanced devotee does not think, “my class is perfect, there is no need for any addition”. Must show humility and can ask for “comments”? In this case the younger devotees, again, must ask questions and not comments. Godbrothers or devotees of the same time could say something. Personally, I don’t like to comment on the classes of others because they are following a line of logic and interrupt it is not good. If the senior devotee really wants something to be said (I have seen that sometimes someone appreciates creating an atmosphere of debate), then devotees of the same level could say something. As for me, I have had very bad experiences with comments and debates and I prefer to receive questions.